Gladiator is a game which transports you back to Roman times and the era of life and death combat for entertainment. 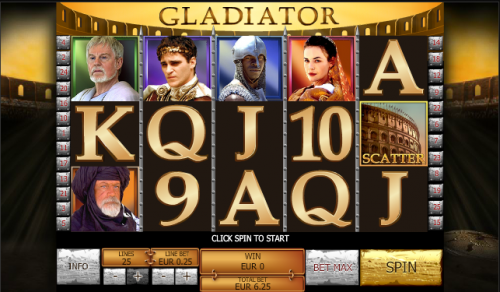 This particular online slot machine is based upon the 2000 movie of the same name starring Russell Crowe; it won five Oscars so this slot has plenty to live up to. The first thing you notice about this Playtech slot is some suitably dramatic music as the theme to your game and the whole thing takes place within the confines of the coliseum. There are five reels and twenty five paylines and the low value symbols are golden playing cards; higher value symbols are all characters from the movie so we have Antonius Proximo, our hero Maximus Decimus Meridius, Senator Gracchus, Lucilla and Commodus the baddie. 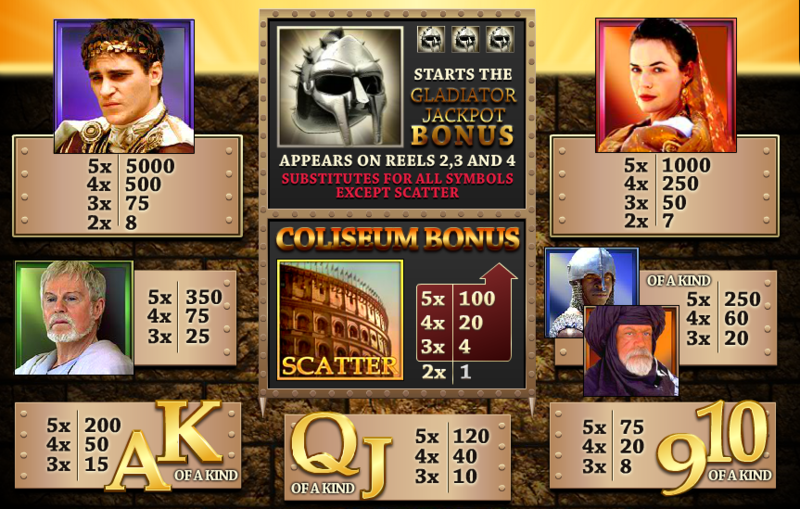 Special symbols are the Coliseum scatter and the Gladiator’s Helmet which trigger the bonus features and there’s also a progressive jackpot to be won in one of the bonus games. The way to trigger this feature is to land three or more of the Coliseum scatter symbols anywhere on the screen; you’ll then be transported to a screen with four levels labelled from the bottom up as Free Spins, Multiplier, Extra Scatter and Extra Wild. Your task is to pick a stone from each row, starting with the number of free spins on the bottom and adding extras to that number such multipliers as you work your way up. Once you’ve completed these picks the free spins round will begin. You can’t re-trigger the Coliseum bonus while in this phase but landing Commodus on reel three will give you three more spins. This bonus feature is triggered by landing three Gladiator Helmets anywhere on reels two, three and four; you’ll then be taken to a screen featuring nine gold, silver and bronze helmets. You don’t get to choose anything here but each helmet is worth a cash amount and they’re all added up and awarded to you. Nine gold helmets here will win you the often massive progressive jackpot. Gladiator is a slightly plain-looking slot when compared to some of the more graphically impressive machines around currently but it’s still worth a go, especially for the bonus games. All stakes are catered for with bets as low as €0.01 for one payline up to €250.00 for one spin.